Proud to be a dealer for Seigler Reels. 100% Made in the USA with a Lifetime Warranty! 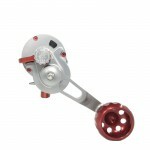 Reels that are Lightweight, Left or Right Hand Retrieve and cast a mile. We have a variety of rod leashes to help you secure your rods while not in use to prevent them from accidentally being lost while in transit to your fishing spot or if you should happen to role your kayak.